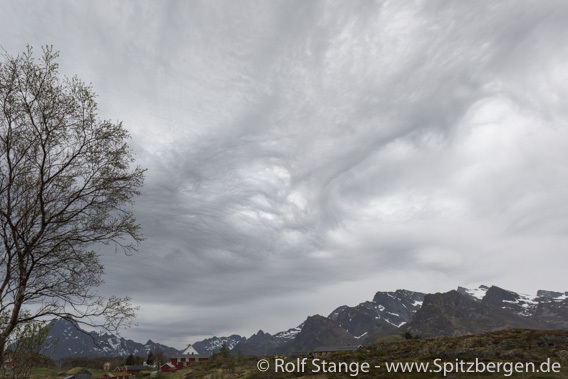 One night’s sailing had taken us far into the inner branches of Isfjord and we woke up to a fantastic panorama in Billefjord. Mirror images on the water and dozens of seals lying on the ice! No landing to start with, as the bay was still frozen and the shores blocked by ice, but we thoroughly enjoyed. It was locigal to continue just around the corner to the mighty Nordenskiöldbreen. 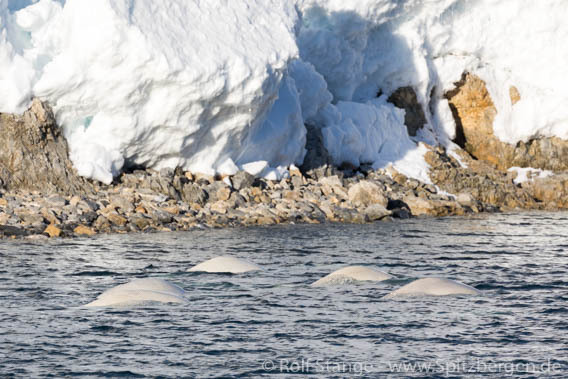 One of Isfjord’s biggest glaciers and more or less our last chance for a polar bear sighting. Then it was time for a landing. Chosing a beautiful spot in Billefjord not far from Nordenskiöldbreen, I went back to old “hunting grounds” (not literally) which brought back many fond memories. That was just me personally, but everybody enjoyed the walk, the scenery and the silence. Brucebyen was the site where a Scottish company investigated coal occurrences around 1920. A short-lived adventure. 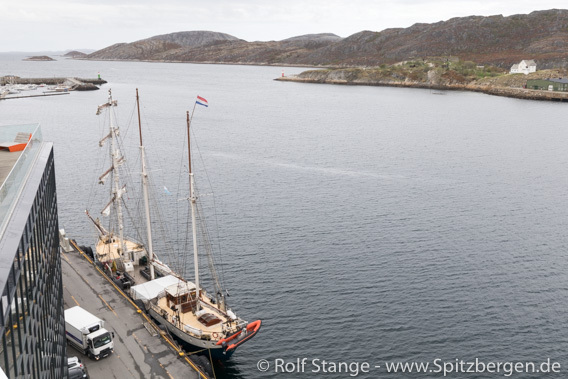 Then, finally … we were almost on the way out of Billefjord, then we got our polar bear! Distant, yes, thus certainly not allowing for world-class photography. But it was our polar bear! Clearly visible with binoculars, it brought a smile on everybodies face. 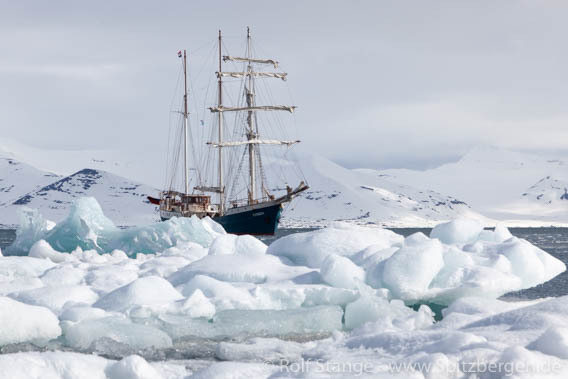 So it was a happy ship that set course for Longyearbyen in the late afternoon. It is really fully winter still here in Isfjord. Snow, snow, snow. Add to that some sun, the sound of a birdcliff in the background and a wide panorama of fjord and coast, mountains and glaciers, reindeer and geese on the first bits of open tundra. Does it get more beautiful than this? Hardly. Some golden moments at Alkhornet. 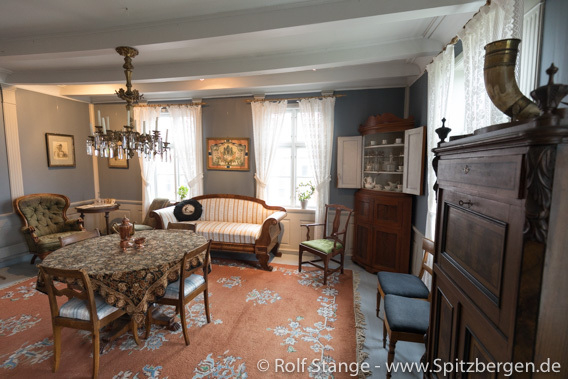 Many will probably agree that Barentsburg is not more beautiful, not in a classical sense. But different. Very different! It is historical and political. We did have a close look at all of this. 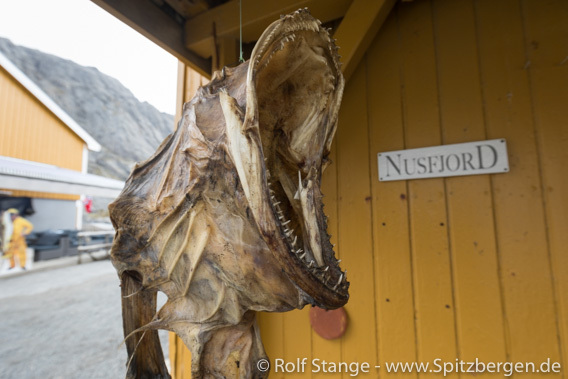 If you have missed this, than you have not fully understood what Spitsbergen is all about today. Lenin would agree. Looking back at the last couple of days, we had plenty of good reasons to raise the glasses to a wonderful trip. So we did in the evening. A skål to Captain Mario and chef Piet! And of course to the whole crew, but captain and chef are key positions as everybody knows who has travelled on a ship. A word for all of you who have travelled on Antigua in recent years and who are curious how things are going here now: of course I was also curious how it would be after our former Captain Joachim and chef Sascha had set course for new adventures. Big shoes to fill, as all of our fellow travellers will confirm. So I am more than happy to tell you know that I am looking forward to many more trips to come with Antigua! We have had a great journey now (and still not finished yet)! Thumbs up for the Antigua-chef Piet! 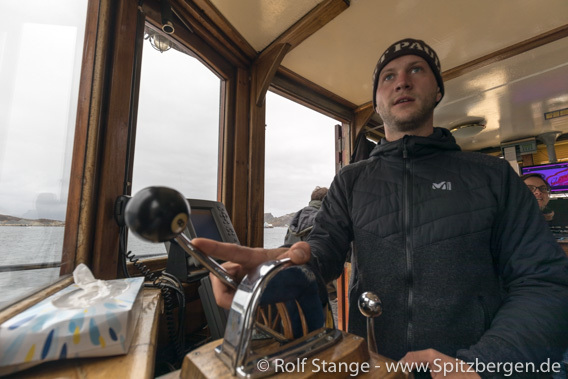 Always keeping a good eye on the weather forecast, we decided in Stokmarknes to make this our departure point from the mainland of Norway and to set course directly for the Barents Sea and Bear Island. There is a lot of wind in the north Atlantic, and if we are too late, we will get more of it than we will like, and we will get it on the nose. So, better to be out early to avoid that! Taking off here and now, we have a good chance for very fair sailing winds on our way north. 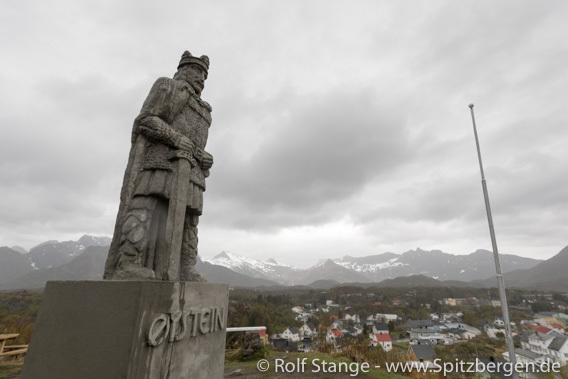 So we said goodbye and farewell to mainland Norway in Stokmarknes and a few hours later we were already at sea. 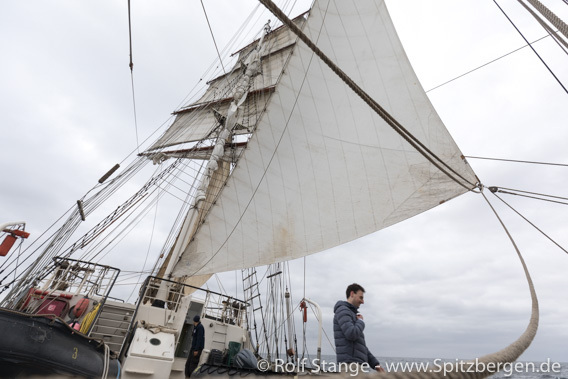 Sails up and course for Bear Island (Bjørnøya)! That was our motto for the next roundabout 44 hours. Sun, sailing with 9-10 knots, those were the themes of the day on Wednesday. The same, just without sun, on Thursday morning, but now we have got Bear Island 20 miles ahead of us and we will drop anchor in a very few hours! This bridge last night turned out to be an interesting thing. 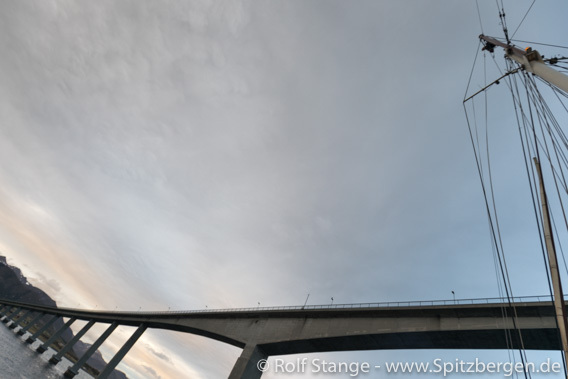 A 30 metre high bridge and a 31 metre high ship. Well, but the 30 metres of the bridge are the guaranteed minimum hight above the highest high water ever. To be sure, we sent mate Nick up the Besan to see if the main mast would fit. It did. There were still several metres of space. Soon thereafter we had reached Stokmarknes in the late evening hours. 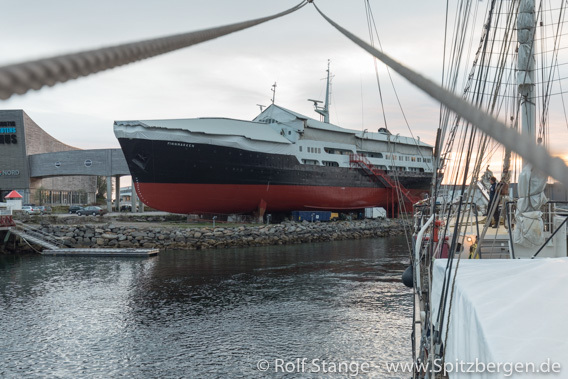 Next to us, the old Hurtigruten ship Finnmarken is beached, now serving as a museum. Old Hurtigruten ship Finnmarken, now a museum, in Stokmarknes, Vesterålen. After a lovely sunset (the last one of the voyage!) and a calm night in the harbour, we woke up to found the day to be grey and rainy. 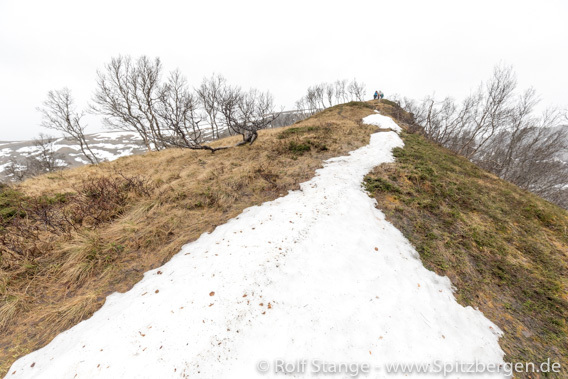 Nevertheless, we went off for a nice hike up the hills behind Stokmarknes. Snow fields in the mountains behind Stokmarknes, Vesterålen. 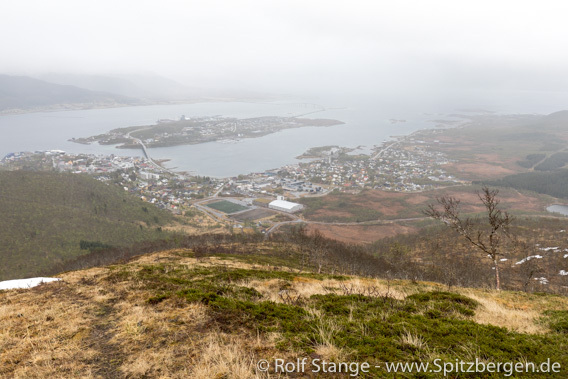 Nevertheless, it was a good hike with some nice views under the clouds, and it is always good to get some exercise. Especially if you have got some days at sea ahead. 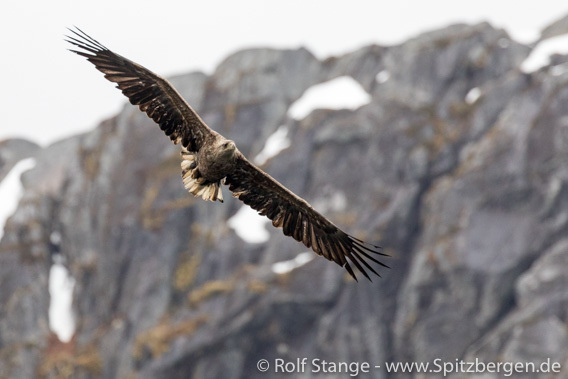 And we will soon set sail for Bear Island (Bjørnøya)! Grey view of Stokmarknes, Vesterålen. 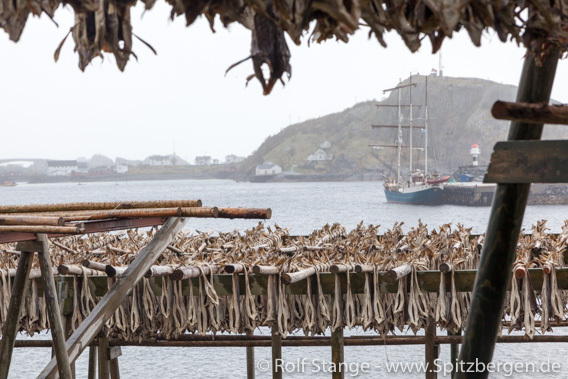 We were a bit curious how it would be to get Antigua into the small harbour of Nusfjord in the strong winds that we had, but they just calmed down and it turned out to be fine. And so did the afternoon. The weather cleared up and it got really nice and pleasant. 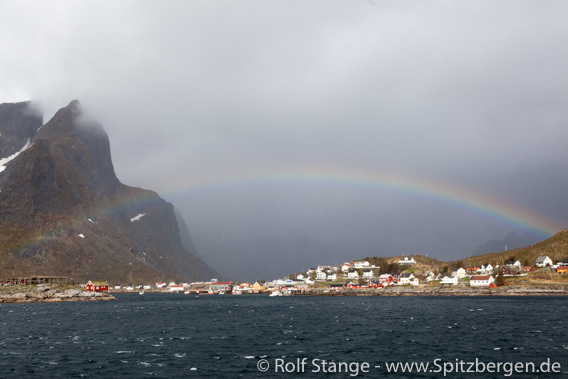 And then, Nusfjord is such a lovely place! 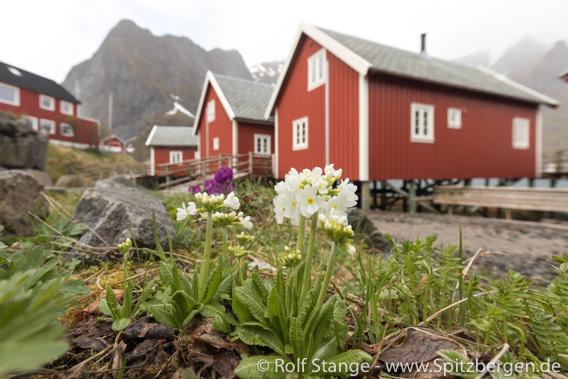 Probably the most famous of the traditional Lofoten fishing villages, Nusfjord is a beautiful setting of old buildings around a small, well-sheltered natural harbour. 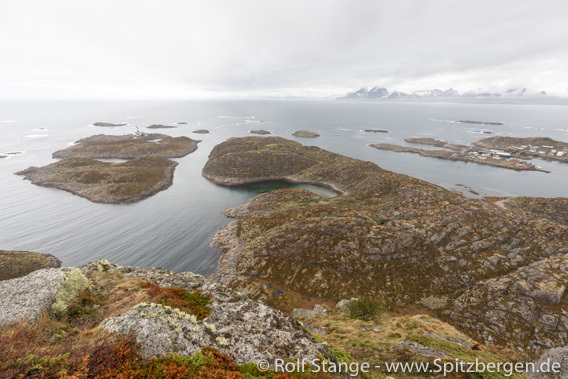 The old shop was open and very popular, and we went hiking over some rocky hills near the sea, enjoying the views over mountains, the coast and Vestfjord. An extremely enjoyable afternoon! The harbour of. And, actually, the whole rest of it. 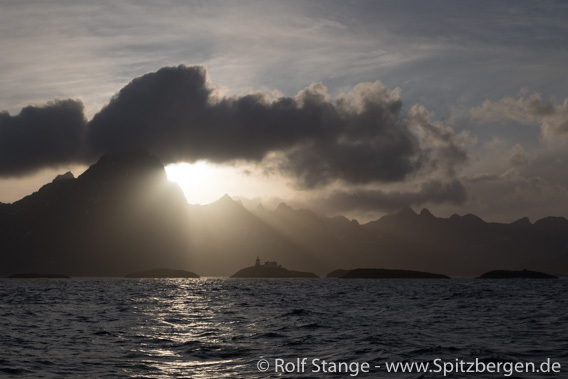 Now we are sailing north (or east, rather) in the evening sun, heading for Kabelvåg. Bodø! This is where the arctic circle is closing. Not the arctic circle that marks the southernmost appearance of the midnight sun, that is at 66°33’N, about 44 miles south of Bodø. But the circle of the arctic sailing adventures of the summer. The first sailing trip of the arctic starts here in Bodø now in late May and the last one will end here in early November, closing a very large circle of thousands of miles sailing arctic waters, many kilometers in Zodiacs in the fjords, hiking on the tundra, on mountains, lots of adventures, wind and weather, encountering wildlife of all sorts, meeting people … and there will be lots of great photos and many entries here in the arctic blog 2018. 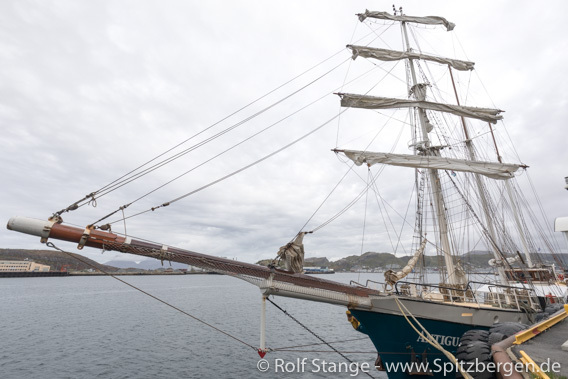 SV Antigua ready to set sail in Bodø. 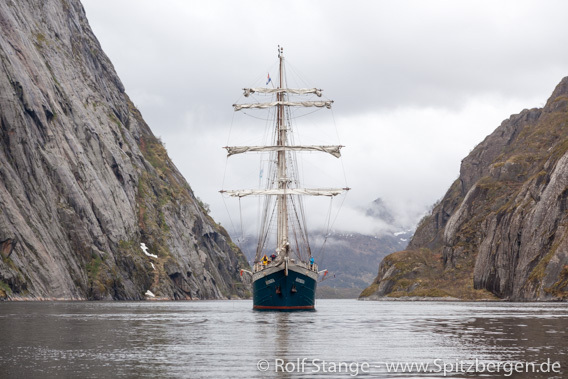 We will be complete in a few hours, with about 30 travellers from the Netherlands, Germany and Austria, and then we will sail across Vestfjord to spend the next days in Lofoten. 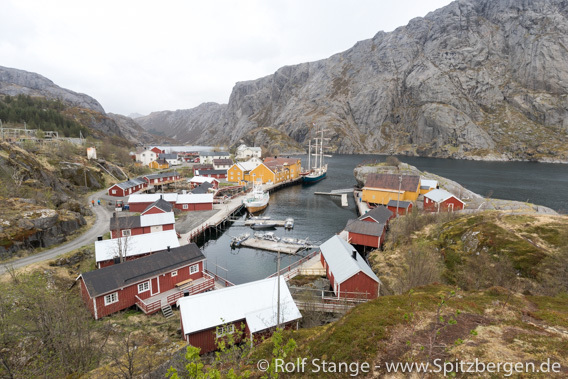 Later, we will sail northwards to Tromsø and then the Spitsbergen adventure will start. 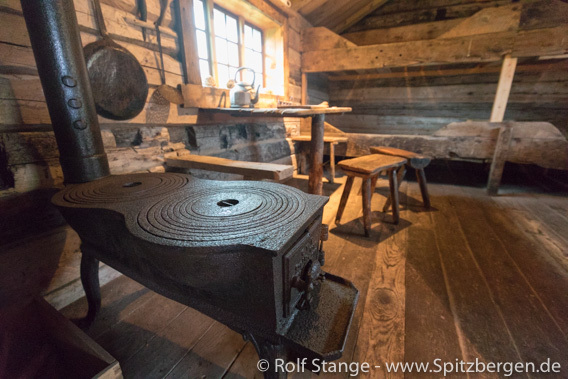 If you want to join us digitally, then just come back and visit this blog! The Arctic ice is significantly more contaminated with microplastics than previously assumed. 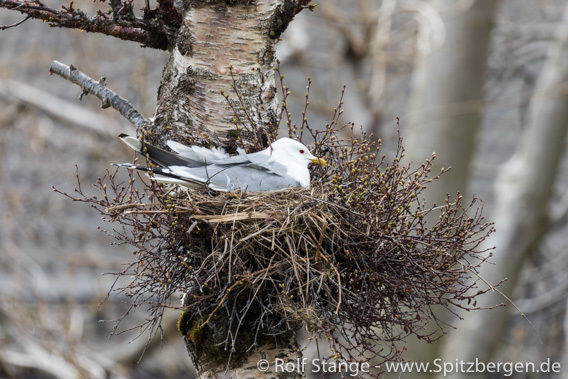 This was the result of a study of researchers at the Alfred Wegener Institute in Bremerhaven which was published in April. Samples from three expeditions in 2014 and 2015 were examined, and thanks to an improved examination method using infrared light, more and significantly smaller parts could be identified than in previous investigations. Presumably, the microplastic originates from the great garbage patches in the Atlantic and Pacific Ocean between Hawaii and North America. But local sources of pollution have also been identified, for example paint particles from ships or nylon particles from fishing nets. Microplastics are tiny plastic particles that are smaller than five millimeters in size. It is produced during the decay of larger plastic parts, during the washing of synthetic fibres, but is also contained in many cleaning and cosmetic products. Little is known about the consequences of microplastic contamination for the environment and humans. In laboratory studies, however, mussels showed inflammatory reactions and fish behavioural changes. Also plastic waste from central European countries including Germany ends up in the Arctic. 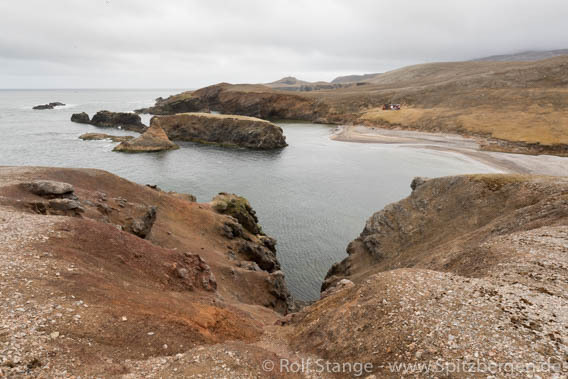 For example, the investigation of plastic waste collected on Spitsbergen’s beaches, revealed that seven percent came from Germany! 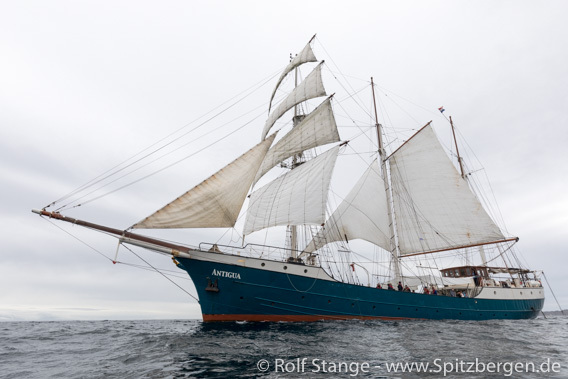 Every year tourists collect tons of plastic garbage from the beaches in Spitsbergen encouraged by private and public initiatives, by the way also on the Spitsbergen sailing trips with SV Antigua :-). 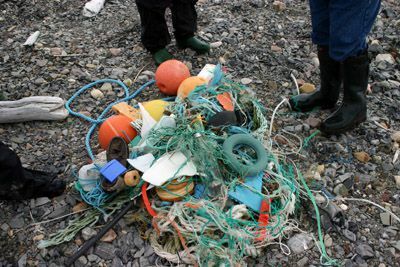 Plastic waste collected on the beach of the Hinlopen Strait, Northeast of Spitsbergen. The Ocean Cleanup develops technical systems with the aim of reducing a huge plastic vortex in the Pacific by 50% in five years and ultimately supplying the filtered plastic to recycling systems. Ocean Care carries out protection and research projects, organises campaigns and educational projects and is involved in international bodies, for example as a UN special adviser on marine protection issues.